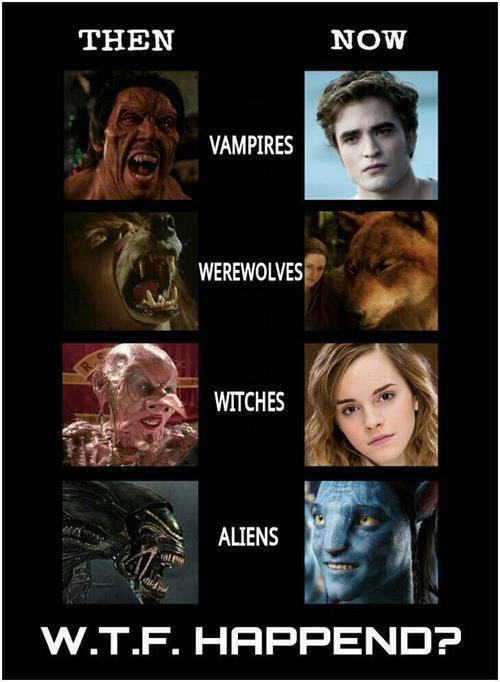 An aliens and monsters meme floated around Facebook this morning with this annoying cast of images. The meme depicts aliens and monsters in pop culture transforming from ugly and monstrous to attractive and desirous. It asks WTF happened? The Hollywood other is cuddly; the real other is not. This goes back to a previous post about changing my mind regarding the politics of representation. For many years, I believed in the power of representational politics to change the world. The politics of representation should have brought about policy and institutional change. Winning the culture war should have brought victory in the policy war.Today, I’m not certain. Hermione is a pretty witch, but the VAWA (Violence Against Women Act) was barely reauthorized. After all this time, I would rather have the ugly witches back.